Hotel Jimbaran Puri Bali is the villa of the on the beach that faced the Gulf of Jimbaran. 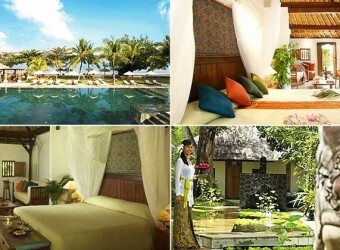 41 villas are cottage type, and the beach side restaurant has the sunset view. King size bed has canopy, and bathroom is also unique structure. It is simple and cozy, really romantic resort for adults. Jimbaran Puri Bali offers open and Balinese style holiday for all guests. I stayed and relaxed at villa for 4 days and I got excellent service that is like hotel service, watching TV, toast while drinking some beer at the private pool, very relaxing!